Birth Name: Robert John Downey, Jr.
Robert Downey, Jr. is an American actor, musician, and producer, also credited simply as Robert Downey. He starred in many Hollywood films throughout the 1980s and 1990s, and more recently in Good Night, and Good Luck., Zodiac, Tropic Thunder, and as Iron Man in the Marvel Cinematic Universe. Robert is the son of actress Elsie Ann (Ford) and director, writer, and actor Robert Downey, Sr. His sister is actress Allyson Downey. Robert’s father is of one half Lithuanian Jewish, one quarter Irish, and one quarter Hungarian Jewish, ancestry. Robert’s mother had Scottish, English, German, and Swiss-German ancestry. 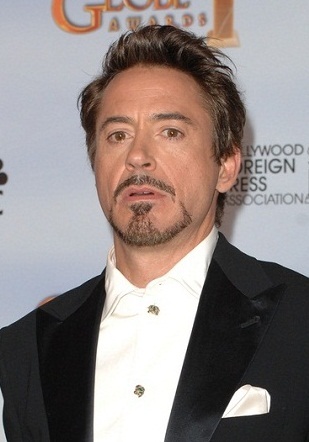 Robert’s father was born with the surname Elias, and later changed his surname to Downey, after his own stepfather. Robert is married to producer Susan Levin Downey; the two married in a Jewish ceremony (Susan is Jewish). Robert has a son with his former wife, singer and actress Deborah Falconer; and two children with Susan. Robert’s paternal grandfather was Robert R. Elias (the son of Yosef/Joseph W. Elias and Golda/Gussie/Augusta Goldberg). Robert’s grandfather Robert Elias was born in New York. Yosef and Golda were Jewish emigrants, from Lithuania, Yosef from Jonava and Golda from Prienai/Pren. Yosef was the son of Meyer Eliasovitz/Elias and Bealia Cohen. Golda was the daughter of Moses Chies “Morris” Goldberg and Khala/Khaia/Chala Gitel “Ida” Algaze/Algazy. Robert’s paternal grandmother was Elizabeth Jesse “Betty” McLoughlin/McLauchlen (the daughter of James Robert McLauchlen and Ellenore/Eleanor “Ella” Ormay). Elizabeth, who was a model, was born in New York. Robert’s great-grandfather James was born in Massachusetts, to parents from Canada, John Robert McLauchlen, from New Brunswick, and Jessie Murray, from Nova Scotia, and had Irish ancestry. Robert’s great-grandmother Ellenore was Jewish, and was born in Hungary, the daughter of Rudolph Ormay and Ilke/Ilka Helen Stern. Rudolph’s parents were Herman Ormay and Elizabeth Heiman. Ilke’s parents were Rudolf Stern and Ilke Rosisatier. Robert’s maternal grandfather was John Webster “Eddie” Ford (the son of John Ford and Mary). Robert’s grandfather John had Scottish and English ancestry. Robert’s maternal grandmother was Fay/Faye Marguerite Schoch (the daughter of Cyrus A. Schoch and Elsie May Peightal). Faye was born in Pennsylvania. Cyrus was the son of Henry Lewis Schoch, who was from Bavaria, Germany, and of Catherine/Katherine Schucker, who was also of German origin. Elsie was the daughter of James Peightal and Sarah Ann, who were of German and Swiss-German descent. I think he is a very good looking man. I wonder what his non-white dna is? There is some I can tell. @Hill what ethnicity is Robert Downey Jr. more than 37.5% of? I’m not sure why but I thought only his grandfather was Ashkenazi Jewish? Yes, that was what was reported for a long time, that his father is of half Eastern European Jewish and half Irish descent. As it turns out, though, Downey’s grandmother had a father of Irish descent and a mother who was a Hungarian Jewish immigrant. Henry Louis Gates, Jr. uncovered this during his research on Downey’s ancestry in 2012 and wrote about it in his book. It looks like Downey didn’t know about his additional Jewish great-grandmother, Eleanor Ormay, until then.